Appleton Straight strain relief liquidtight connector with threaded hub connection, accommodates conductor of size 0.625 to 0.75-Inch. It has a trade size of 1-Inch. 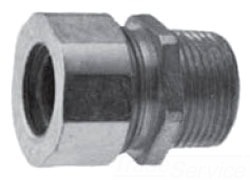 This 1.38-Inch Dia connector has machined steel body/cap, neoprene grommet, steel washer for added strength. It is suitable for use in wet or dry locations. Connector meets UL, CSA, Class I, Division 2, Class II, Divisions 1 & 2 Class III, NEC 501-4(b), 502-4(a)(2) and 503-3 (a) standards.